The Instax Square SQ6 isn't Fujifilm’s first Instax Square camera, but the SQ10 that came before it isn’t all it seems. 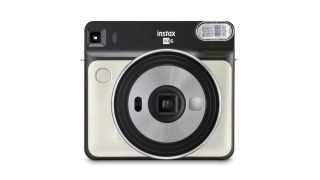 The older model actually uses a digital camera to print directly on the Instax analog film, whereas the new SQ6 is a proper analog camera that exposes the film directly. You don’t get the filters and other controls of the digital hybrid version, but you do get a proper old-school instant camera. The SQ6 produces square images measuring 62 x 62mm (2.4 x 2.4 inches) with a white border on Fujifilm’s Instax Square film packs, with each pack holding 10 films. Alternatively, you can swap the white border prints for a new black border film, launched at the same time as the new camera. Instax Square pictures are much larger than the regular Instax Mini prints, and closer in appearance and feel to traditional Polaroid prints. Obviously instant prints are a lot more expensive than shooting digitally, but their appeal is their immediacy and their uniqueness – that’s why the Instax range is so popular for party-goers. And the camera’s features are clearly designed with this in mind. It comes in three different colors, for a start – Pearl White, Blush Gold and Graphite Gray – and has a sleek, contemporary design. The features themselves are fairly basic, but typical for instant cameras. There’s a direct-vision viewfinder (no through-the-lens viewing here! ), automatic exposure control and autofocus. There are three different focus zones, ranging from Macro (0.3-0.5m) through Standard (0.5-2m) to Landscape (2m and beyond). There’s also a built-in flash for low-light party shots, with the added twist of orange, purple and green filters to give your photos some extra color. As well as Macro and Landscape modes the SQ6 has a double-exposure mode, which combines two images taken separately, and a selfie mode. There’s a tiny mirror on the front of the camera next to the lens to help you get your selfie face ready, and a 10-second timer so that everyone can get in position for group shots. Power comes from two CR2/DL CR2 lithium batteries, which should be enough to see you through three packs of 10 films. The Fujifilm Instax Square SQ6 goes on sale May 25 for $129.95 in the US and AED 629 in the UAE, with prices in other territories yet to be confirmed.